Poland-based Grupa Luxpol has become the first company in the world to take the new Inktec Jetrix LXi8 LED UV printer. The printer, that was showcased at FESPA 2017 in Hamburg, can print at resolutions of up to 1,080x720dpi at speeds of up to 205sqm/hr and features the latest Konica Minolta i-series printheads. 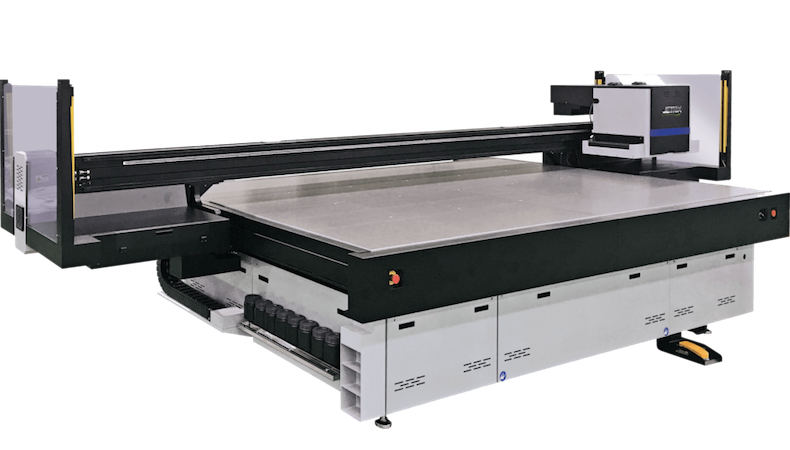 It can handle rigid media in formats up to 3.2x2.03m and 100mm thick. Grupa Luxpol made the choice to opt for the Jetrix as it suited its various production needs: “Working with Print Support, in Poland, we have been watching and waiting for a printer of this capability to come out from Jetrix for a while," commented Grupa Luxpol managing director Marcin Wolek. The Jetrix LXi8, which can print up to seven layers in two to 16 passes to create raised print, is suitable for applications including short-term outdoor signage, clear film window graphics, interior decoration, furniture decoration, industrial applications, industrial keypads, spot varnishing and wood prints. The printer’s LED curing system boasts an extended LED lamp lifetime of up to 20,000 hours and more eco-friendly printing with energy consumption of around 35% less than a printer using mercury lamps. The manufacturer said this curing system eliminates risks associated with the impact of heat, such as media deformation. Inktec Europe managing director Joey Kim added: “There was a lot of interest at FESPA surrounding the Jetrix LXi8, particularly as it truly demonstrated its speed capabilities at the event."